I cannot tell you how refreshing it is to be expecting an issue of a Sonic comic to drop on Comic Book Wednesday and for it to actually happen. 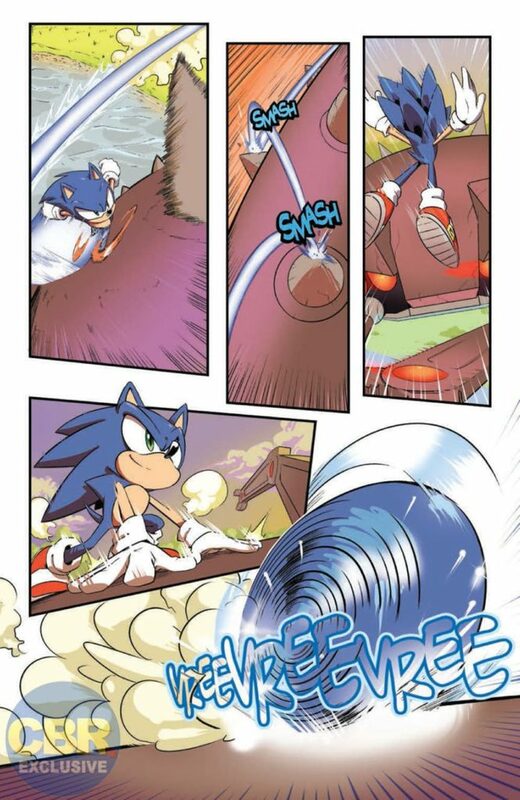 Sonic comics are actually back and releasing consistently again and it feels like a miracle. IDW’s weekly releases are going to make this a very exciting month, and I’m glad to say that this issue keeps the story going with some strong characterization and breakneck speed. Coming straight off issue 1, our hedgehog hero continues to race through various zones cleaning up a mess of badniks left behind from some prior confrontation. The ambiguous post-Forces vibe rears its head again here; a town full of Mobians animal civilians, decked out in weapons and clothes straight from the Forces character creator, fight against a very familiar giant enemy crab. Sonic finds himself inundated by badniks and, as before, a friendly face appears to help him this time the one and only Amy Rose. Amy, an acting commander of the Resistance forces, once again alludes to some sort of “war” where Eggman controlled a vast portion of the planet before being defeated and vanishing. I get the feeling that this arc is absolutely supposed to be in canon with Forces but everyone involved is being incredibly cagey about it. It’s a little awkward, but I’ll take it. 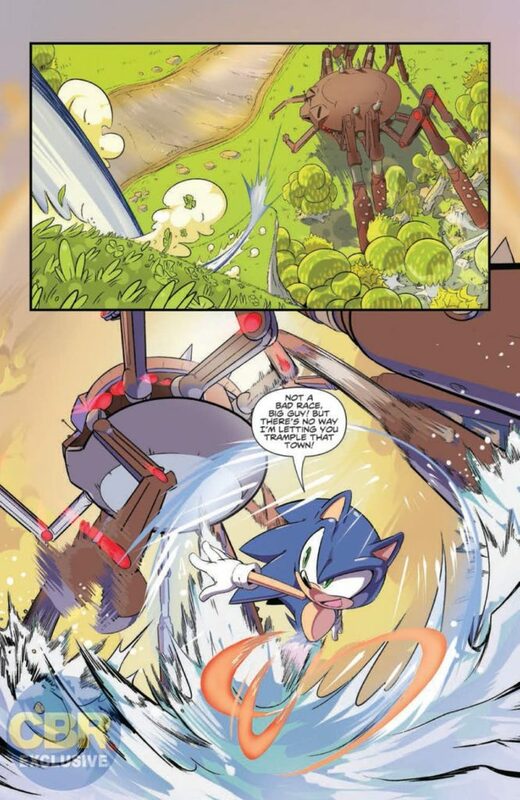 It’s an interesting premise for an arc, and as the Shattered World Crisis used Unleashed as a template on which to grow the extended Sonic universe, Ian seems to be using Forces as a similar springboard. The most surprising thing about this issue is the stark contrast between Tracy Yardley’s pencils in issue 1 and Adam Bryce Thomas’s pencils here. I’m very glad to see the series already evidencing its tendency to let artists take the characters into their own hands. Tracy’s art is cartoony and fluid; Adam’s pencils are rigid, bending only to show the blur of action or emotion. There’s a particularly effective sense of speed in this issue, stiff pencils giving way to crisp dashes and wondrous explosions. A particular scene, the “croquette bomber”, is not only a brilliant piece of art, but stands as an excellent example of how to build Sonic and Amy as partners and allies rather than just a weird one-sided crush. Tyson Hesse’s A cover is a gorgeous continuation of his cover from issue 1, with a variant cover from Adam Bryce Thomas and yet another killer piece of art from new artist Nathalie Fourdraine. 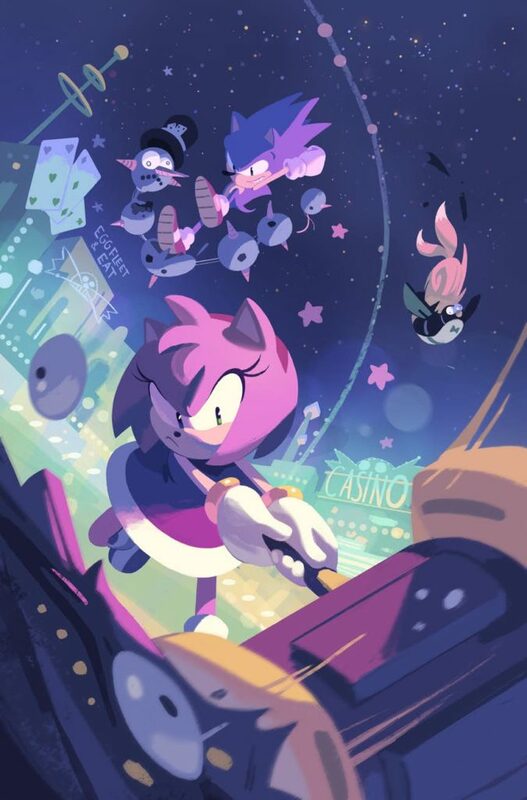 Let’s talk about Amy Rose for a second. She’s a hard character to peg, certainly if you’re isolating her portrayals to the games. She’s got a cool weapon and has handily defeated many badniks of her own; her entire character arc in Sonic Adventure is about her moving on from being the dopey Sonic fangirl from CD to gaining some form of independence, even if part of that independence is fighting to be by Sonic’s side. However, plenty of her depictions seem to ignore this; Adventure 2 relegates her to the role of a side character, and games like Heroes, Battle, and Free Riders do her a disservice by framing her solely through the lens of her crush on Sonic. That troublesome characterization is why I liked her so much in the later Archie books. Writer Ian Flynn worked hard to make her a worthwhile member of Team Freedom, and cemented that characterization by pulling her away from Sonic entirely. The Shattered World Crisis smartly gave readers a chance to see Amy paired alongside other characters and allowed her to work with Knuckles and be a vital part of saving Angel Island from Nagus and Eclipse. It’s hard, then, to see her through the lens of her relationship with Sonic again—though it’s clear Flynn isn’t backing down from his attempts at making her a stronger character. This issue assumes that new readers know her on the basis of the games. Her personality here blends her “My Sweet Passion” desperate crush from Adventure with her position as Resistance general in Forces. It mostly works. Amy isn’t robbed of the character trait that’s made her appealing to many fans (looking at you, SonAmy shippers) while still allowing her to be an independent and powerful ally. It’s a hard balance to strike. I do think that reintroducing Amy through the context of her interactions is a good starting point, especially for newcomers, though I’m quite excited to see her interact with other characters again. Coming into these new comics, one of those old sticking points was the issue of romance. Archie’s Sonic, pre-soft reboot, was full of it, for better or worse. Sonic’s infamous on-and-off flings with women like Sally, Mina, and Amy provided fodder for the comic’s conflicts and arguably did a disservice to the characters involved. Sonic and Tails—probably two of the closest friends in fiction—had an actual fistfight over Fionna Fox once. It’s complicated; some readers liked that kind of conflict. As a reviewer, I’m going to be subjective here in saying that those kinds of conflicts simply do not fit in a Sonic book. I read shipfics as much as any other loser girl who’s been into Sonic since she was like 8. I love the idea of Sonic falling in love and having a family and building a retirement plan and all that goopy nonsense. In canon? There’s no room for it. Sonic himself says it in this issue – he “can’t play favorites!”. Suffice to say I don’t think this will happen again. I will say that I’m glad that Flynn isn’t ignoring that part of Amy’s character. She definitely still loves Sonic, this issue makes that very clear. For shippers, there’s plenty of blushing and cute interactions to gossip about and write fanfics based on. For everyone else, Sonic and Amy come off as two old friends that have a very unique dynamic in a fight, even as Amy works to move past her hopeless crush. Overall, I’m quite happy with this issue. I’m glad to have a Sonic comic again, first and foremost, and I’m exceptionally glad to have it feel as familiar and as consistent as it has thus far. Starting with a Sonic/Amy showcase issue this quick is sorta like diving into the deep end of the pool when you’re still learning how to swim. This is going to be a divisive issue for certain parts of the fandom, and I’m honestly glad they’re addressing this sooner rather than later. This arc feels a little slow, given that I find myself antsy for Eggman to show up and the real conflict to begin. 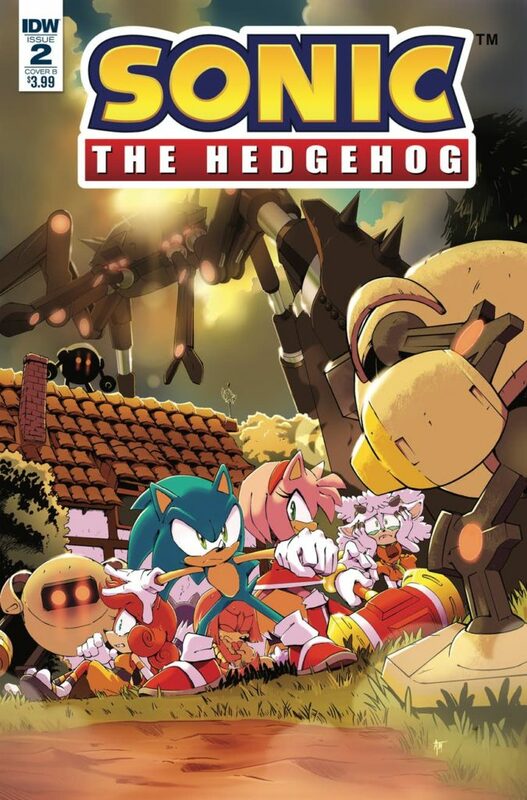 Though, admittedly, the next month is super exciting: two new villains, Knuckles’s triumphant return, the introduction of Tangle, and the first comic with Blaze the Cat in it since 2013 (no, seriously, it’s been five years). I do think we’re seeing a great start to what will hopefully be another couple decades worth of comics, and I’m more than ready to see what’s next.